As previously determined, we reconvened in Brithem, the party having safely delivered the weaponsmith and his family following their rescue from Whisper's camp. Though bereft of their possessions and physically depleted from the events in the forest, the fiefdom offered the victims true sanctuary, and for that they were immensely grateful. Brithem, itself, was yet recovering from the destruction wrought by the dragons: a memorial had been erected outside the castle grounds to honor those who had died, and the remaining populace and soldiers were hard at work reestablishing farm production and repairing the keep. With the trade season now in full flourish, the days were long and wearisome. Amid all this, two young travelers from the south, a brother and sister who claimed themselves missionaries of Tyr, arrived in recent weeks and offered their hands to the fiefdom. The party spoke to the pair separately: the man, Lucido, the elder sibling despite having seen fewer than eighteen winters, spoke humbly of their journey north, taken under the employ of a benefactor in Leilon named Elidar Highborn; the woman, Winifred, was already acting as caretaker to the victimized family and carried herself modestly indeed. Both siblings were quite fair, drawing the eyes of the men and women around them at every turn. So it was that the party passed time in the fiefdom healing from their injuries and honing their crafts, when late one evening a report arrived that a patrolman failed to come in, hours after he was to have returned from a quarter-perimeter ride near the marshlands. Having had their fill of downtime, the party saddled horses and rode toward a northeasterly landmark known as Claw Rock, with Merlin the owl flying out ahead and warning Riwyn of danger a short way into the marsh. At the edge of the plain, the party tethered its horses and located the eviscerated steed of the missing soldier, though not the patrolman himself. Casting a light spell over the rocky spire a hundred yards away, the adventurers caught a glimpse of doglike silhouettes marauding about its base; wading into the wetlands to close distance, the party aimed bowshots at the creatures they could discern. A gnoll from the outcropping returned fire while another bounded through the willows, tearing into Riwyn with its claws. In the moments that followed, the gnolls acted strangely defensive, eventually succumbing to the party's swords and arrows in a small cave formed into the rocks, where a mother was protecting three gnoll pups, which Arendeth slew. On the cave floor lay the mostly-consumed body of the patroller. The next morning, the captain of Brithem's soldiery bade the party to accompany him back to investigate further, as gnolls traversing the wetlands could indicate a greater threat in the forest beyond, as when the two black dragons had taken residence there previously. The fiefdom would be ill-prepared to deal with another such menace, so quick and proactive measures were needed. Sharing Roth-grim's concerns, the party agreed. A day venturing beyond the wetlands and into the dense canopy of the Witherwood revealed no additional signs of gnolls, but turned up a fallen stag untouched by scavengers, its hide mottled with festering boils. Using chalk to mark the stag's location and their return trail, the company made for the keep before nightfall with more questions than answers. Was the gnoll combat interesting for the group? It's not always easy to judge as DM. While the gnolls weren't atypical and the fight was littered with rounds of miss/miss/hit/miss, I felt like the marshy terrain, the spire, and the discovery of the gnoll pups made for a memorable encounter. Whatever the edition, combat rules can only do so much to hold a player's attention. Spells and outside-the-box thinking help too, but for me, the overarching scene and the imagery it invokes are what I tend to remember long after the details fade. A good DM should be able to make even a trivial encounter using the simplest ruleset something special to the group. Not much commentary from me aside from that. We were back at it after a lengthy delay, and consequently spent time at the beginning of the session reviewing the party's recent dealings and discussing the state of Brithem upon their return. I still really enjoy running the fiefdom; its unique situation and placement make it both stable and volatile at the same time, and Berwyn's background contributes to it greatly. On a side note, I recently gave the blog a minor facelift, along with a cool visual feature if you check back often and pay attention. I wanted the look of the site to feel living and breathing, like the campaign world itself. I also disabled the site's mobile view, which I can put back if it inconveniences anyone. I prefer seeing the standard web version, and figure that everyone following the posts is probably doing so by email. It's probably useful if I outline the procedure for learning new spells from other wizards' spellbooks. We've looked, previously, at the parameters around using scrolls, which are effectively a one-time-use means for supplementing a wizard's spell slots. Spellbook writings are permanent, though the rules for copying them are similar. Once the spellbook's writings have been deciphered, the wizard can attempt to copy any number of its spells into his or her own spellbook, using his or her own personal notations. Each spell requires a successful Chance to Learn Spell roll, with failure indicating that the spell cannot be learned at the present time. A new roll can be attempted (assuming that the wizard still has access to the spell) upon attaining a new level. Note that a wizard isn't able to memorize spells directly from a foreign spellbook, only from the wizard's own spellbook. Feel free to post any questions or clarifications as comments. I did, in my previous post, wholly forget to make note of the Calishite wizard's plundered spellbook, which Riwyn is presumed to have in her possession and to have perused with a casting of read magic. No additional XP award for obtaining this, though Lincoln is surely glad that it no longer resides in the hands of an enemy. The party's most recent agreed-upon direction was Brithem, in order to get the victimized family to safety. We can pick up from the fiefdom the next time we play. It's not too long or treacherous a journey to skip over the details. With all of this, the one plot point I will enforce from the get-go (to Wren's dismay, I'm sure) is Rumolt's departure north (toward Luskan) with the scepter from the crossroads. This was always his intended path, and nothing short of sword or spell was going to keep him with the party beyond this point. He's been a dagger in the party's gut for some time now, and it's time for the group to find some internal cohesion without him. The world is dynamic and fluid, so it's certainly possible that he crosses your path again. Sara can write a romantic sendoff post if she feels so inclined. Lincoln and Arendeth have each attained 5th level; we can assume adequate time passed in Brithem for their advancement. Following the interrogation of the bandit, the party weighed its options, lacking an obvious trail to the smith's wife and daughter. Finally, hitherto silent, Rumolt imparted that he possessed the means to locate Whisper's hideaway, and would do so in exchange for the jeweled scepter and an amicable parting of ways upon returning to the road. As he had no desire to risk the dangers of the forest alone, Rumolt furthermore offered to aid the party in an assault and rescue attempt against the bandits, after the camp was found. The PCs deliberated the arrangement at length, but ultimately agreed. At dawn, Lincoln handed the captured highwayman a roll of fifty gold coins in exchange for his departure and a promise to live an honorable life upon returning to Luskan, or wherever he might go. The bandit consented eagerly, addressing the dwarf with many a "Yes, sir" and bow as he scattered into the trees to the west. When all were ready, the party followed Rumolt's lead, the father, son, and uncle trailing closely behind. As they journeyed eastward through the forest, Arendeth inquired how Rumolt would locate the encampment, and Rumolt revealed from his tunic a compass rose made of cast iron, hanging by a thin chain around his neck. The compass, he explained, had come into his possession several years prior, and over time he had learned to utilize its magic, which enabled the wearer to know the direction of specific places or persons through intense mental focus - clearly the same method employed to find the orc ruins, days earlier. Shortly after highsun, the company arrived at a fifty-foot ridge descending a two-hundred-foot wide canyon, at the bottom of which flowed a river that provided a ford. The opposite side of the canyon sloped gradually upward to a plateau ceilinged by a rocky overhang which began a near hundred-foot climb to the continuation of the forest. A winding trail led upward from the left side of the plateau: the only discernible path up for anyone lacking the ability to scale walls. A few minutes of surveying the plateau from tree cover revealed bandit activity afoot, but no immediate signs of the captives. Unwilling to risk descending the canyon, the party made its way downriver a considerable distance after Merlin the owl scouted the terrain. A short time later, the party located a reasonable crossing and easier ascent to the opposite cliff. Once atop it, they formulated a plan while waiting for nightfall. Wren approached the plateau area from the ridge above it at twilight, spotting a burgeoning fire underneath its overhang, which was surrounded by a cluster of highwaymen. Honoring their promise, Arendeth drew forth the magic scepter and handed it to Rumolt, who tucked it away securely in his pack. Together, the company moved in, thieves repelling down the ledge while Arendeth, Aranos, and Rumolt took to the trail. As the latter group neared, arrows volleyed to and from the plateau, and Aranos was felled by magical sleep. Rumolt continued to fire while Arendeth closed and Wren, Lincoln, and Riwyn dropped in from above. Jhakine, the Calishite mage, could be seen spellcasting behind the bandits, and as Lincoln was pummeled by magic missiles, a flickering form thrust a blade into Wren from behind, laying her low in a single, deadly strike. The figure disappeared from sight again as a bloodbath ensued; the battle saw Lincoln fall to his injuries before Arendeth crushed the Calishite mage's neck with his morning star and the remaining bandits were slain. As Wren's body clung to the last vestiges of life, Rumolt rushed forward, removing a potion flask from his belt and emptying its contents down her throat. Lincoln, unconscious but breathing, was revived, and a search of the cavern revealed the smith's wife and daughter - alive, though greatly battered and incoherent - and a dark tunnel leading from its depths. 1. a set of circumstances in which one finds oneself; a state of affairs. I understand that Rumolt has been a point of frustration to the party for a handful of sessions now. In this campaign, my method has been to introduce places, and people within those places with their own histories, motives, and agendas, come what may. I'm not executing to an intricate grand design; I'm creating situations that intersect the party's path, and allowing the plots to weave themselves. In this way, the characters have a large degree of control over their own destinies. It's always been five against one. Rumolt has always been a burden that the party, for all intents and purposes, has commanded the power to rid itself of. The question has always been the terms under which the sides would part ways, and the concern felt by the PCs in allowing a man with unclear motivations to knowingly leave the company in possession of a powerful magic item. But I've never tried to hold anyone's feet to the fire. If any of the group members feel that way, I'd want to explore the reasons why. Have the events with Rumolt been fulfilling, or dispiriting? Enjoyable, or woeful? My hope, at least, is that they've been entertaining, and memorable. I can't rightly end this section without a mention of how close Wren tarried to character death during the melee. At 18 hit points, Whisper rolled a critical hit for max damage on the attack roll for backstabbing, reducing Wren to -6. Three rounds elapsed with no healing or attempts to stabilize, taking her to -9. As the "death's door" points tick off at the end of each combat round, Rumolt fed her his potion during the last possible moments before she'd have descended to -10 and died. That's crazy close. I'm really glad I make my rolls publicly. I don't consider the party to be at a suitable "safe point" for awarding XP, amid the Neverwinter Wood with Whisper still at large. The victimized family, while alive and intact, is in need of safe harbor. In the previous recap I made note of items for which XP would be awarded; we now have pending story awards as well, given the impactful achievements made by the party with respect to the campaign world. In the interest of attaining safe harbor and setting a firm direction for the next session, I encourage the players to post comments to this thread to help determine the party's next course of action. Depending on what's decided, I may be able to advance the game forward. This blog is here for you; feel free to use it. Quick story: Last night I played in a session of Sean's 5th Edition D&D game, which he documents here. During the game, our group encountered a wraith, which with some powerful dice rolls struck my character to unconsciousness from nearly full hit points in a single attack. In fact, my character was one failed save away from being effectively slain. This wasn't my least favorite part of the session. It actually didn't bother me at all. I was happy with the decisions I'd made for Nefresil to that point, both from tactical and role-playing standpoints. Untimely things happen in D&D. When making choices, it's important to weigh the odds and understand the impacts of randomness and dice. As a player, you control what you can control and learn to live with the results. If that means your character dies a hero, so be it. My least favorite part of the session was picking through treasure after the combat and being told, without the aid of any spell, that we had found a short sword +1 and a wand of lightning bolts with seven charges remaining. The item never reveals its exact attack or damage bonuses, although the fact that it has few or many bonuses can be determined. If it has charges, only a general indication of the number of charges remaining is learned: powerful (81%-100% of the total possible charges), strong (61%-80%), moderate (41%-60%), weak (6%-40%), or faint (five charges or less). The faint result takes precedence, so a fully charged ring of three wishes always appears to be only faintly charged. Note, specifically, how the AD&D version of the spell stops short of providing the caster with concrete mechanical information about the item. D&D characters don't understand game mechanics, they understand the nature of magical items in abstract terms. Leaving the mechanical details shrouded keeps the players more interested, and less certain. It helps create tension. Tension, in D&D, is everything. To Sean's credit, in his game, the short sword came with a tale behind it that our characters were familiar with from lore. The blade was visibly identifiable as one of a pair that was previously wielded by a renowned historical NPC. The two weapons were never known to have been separated, so the fact that we found this one here, in isolation, was exceptional. Whether this flavor was added by Sean or part of the module he's running, it provides an interesting hook that we could potentially become involved with later on. This is good stuff. Setting that aside, however, we have an issue of transparency. How do our characters know that the short sword is endowed with a +1 bonus? How do we know that the wand casts lightning bolt? How do we know that it has seven charges remaining? Short of casting a spell that yields specifically this information, our characters shouldn't know these things. Being told the mechanical details outright, in addition to breaking believability in the fantasy world, has deprived us, as players, of discovering the properties on our own. Imagine our characters experiencing the horror of unexpectedly running out of wand charges at exactly the wrong time! Because this information was handed to us freely, this can never happen. We need never plan for it. This in turn makes the game less interesting for us overall and reduces our immersion level. Similarly, as DM, there's a fine line between telling the players what their characters observe and dictating the conclusions that the characters derive from what they observe. It's OK to tell the players "The orc shifts uneasily as you step into the room," but the DM shouldn't go so far as, "You know that the orc will attack you if you advance any further." We do? How could the PCs possibly know this without trying? Players need to be allowed to draw their own conclusions about the information provided to them, and being overly transparent as DM waters down the game for players who want to feel immersed. They're being shortcut through the nuances, which often end up being the most fun and rewarding elements of role-playing and decision-making. In the end, I don't want the DM to let me in on the truth. I want to uncover the truth for myself by interacting with the fantasy world. Don't tell me things that my character should not rightly know. It's important to note that the kind of transparency I'm describing here is different from the kind that the DM employs to show that he's playing by the rules and to instill trust around the table. When every DM die roll is hidden behind a screen, it's too easy for the players to feel (rightly or not) that they're being lied to when unlikely things happen. Transparency with dice rolls to remove doubt that the game is being adjudicated fairly is different from transparency with information. The DM at all times needs to be exceedingly delicate with exactly which details are presented to the PCs. Information and spoilers cannot be retracted. Now, at some point, spell or no spell, a player needs to know, mechanically, that his or her character is wielding a short sword +1. The intent of this post is not to say that a player should never be privy to this information at all, simply that it should not be handed over without in-game justification. I'm generally not going to silently add a +1 modifier to a player's attack rolls for months on end; it's reasonable to assume that, over a short duration of using a magic weapon, the PC will get the gist of it enough that the bonus can be conveyed and written down on the character's record sheet. We just don't want to deprive the player of learning the nature of the weapon on his own. It's a poorly-kept secret of DMs that we sorely want, at times, to tell the players everything, to let them in on every minute detail that we've been plotting and preparing over the course of a campaign. But a good DM need always remember that the time for revealing this kind of information is after its in-game relevance has unequivocally passed. Toward the end of their first day traveling west from the ruins, the party was set upon from behind by a gnoll warband, which split into flanking groups and rushed in, throwing small axes from amid the trees. The adventurers stood fast, their swords and magic felling several of the dog-faced creatures before the remaining few retreated into the forest. Injuries to the party were mounting, though not insufferable. As twilight loomed, a suitable campsite was located and watches were arranged without a fire. During the first, Arendeth praised Aranos for his bravery and the proficiency with which the budding warrior fought against the gnolls. In the early morning hours, Rumolt and Berwyn exchanged vagueries regarding their pasts and future aspirations. The following day was met with no additional threats from their surrounds, and as latefeast approached the party was hailed by a short, round-faced woodsman named Banion, a patroller of the hunt trails from the Slumbering Manticore. Though the PCs initially feared that the encounter may have been more than mere chance, Banion led them safely to a well-trodden path that returned them to the inn before nightfall. Amid the grounds outside, the smell of campfire smoke ushered them in, and Constable Rictus strode out to meet them. Readily accepting of the inn's food, drink, and shelter, the party entered the taproom and began to discuss reconciliation terms with Rumolt. Rekindling the tension felt at the ruins when the topic of the scepter was breached, it became clear that neither the PCs nor Rumolt were willing to part ways with the other having possession of the artifact. Emotions peaked when Rumolt spat on the table and called Arendeth a fool at the dwarf's suggestion that Rumolt exchange his share of the scepter for the wraith's black sword and helm. Wren subsequently dismissed Rumolt from the party under implicit threats of violence before cooler heads prevailed, and all took their sleep for the night. The PCs set watches outside their rooms, fearful of attempted thievery by Rumolt or someone else. Arendeth imparted to his companions that a fire trap spell was already cast upon his pack, protecting the scepter. Using detect magic, Riwyn discerned that Wren's longsword emitted a minor aura of evocation magic, the wraith's sword and helm a moderate aura of necromancy, and the scepter a powerful aura of an unknown nature. In the morning, Berwyn met Rumolt in the taproom to further discuss their options. Rumolt committed to no specific course, but his impasse with the party would not be relinquished. The pair convened with the larger group upstairs, with all finally settling on an agreement that Rumolt would continue to accompany them as an equal until the matter of the scepter could be reconciled. Rumolt handed over leather-bound coin rolls owed to the remaining party members, bidding them to rest until all were returned to full strength and their next destination could be determined. Since the moment they crossed paths, the party has been waiting for Rumolt to show his hand. The man's past is unclear, without a doubt, but is not also that of the PCs, in Rumolt's eyes? The distrust between the sides is palpable, and it's been fun to play out in-game. It's interesting to see how an encounter of random chance can be perceived as the first sign of an intricate betrayal. The party is waiting for the other boot to drop. Will it? In addition to XP earned for the past few sessions, which is detailed below, Aranos is hereby promoted to henchman status under Arendeth. This means that Aranos is now formally a first-level character who will begin to accumulate experience, starting at zero. Hereafter, Aranos will receive a half XP share from the group, and otherwise compensated primarily by Arendeth, to whom the warrior has become devoutly and fanatically loyal. Sean will control Aranos fully, and I will only step in if egregious orders for him are issued. The following XP awards cover the last three sessions, the entirety of the time that Rumolt has traveled with the PCs. These are definitely substantial gains, and well deserved. Berwyn ascends to level 4, Riwyn to levels 3 and 4 in her classes, and Wren to levels 3 and 4 in hers. Lincoln is close to advancing, and Arendeth is much closer to his next milestone than he was previously. Totals are updated on the right-hand side of the blog. This post covers a hodgepodge of relatively brief topics. 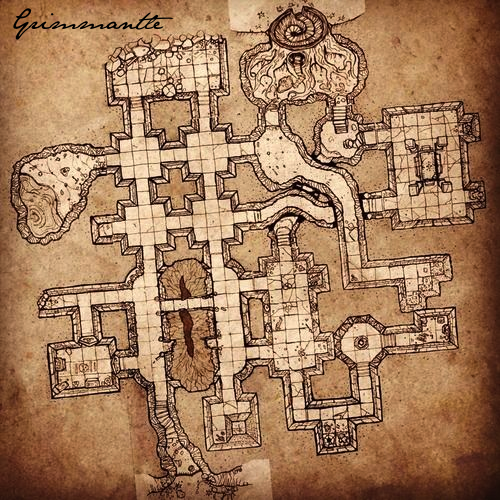 First, here are Wren's map of Grimmantle and an overland map section for the game. This isn't the same map that we've used on paper, but it's easier to read since there's less clutter. I've also reduced the scope in terms of the geographical area pictured; the paper map is a bit overwhelming and denotes many locations that are very far away. 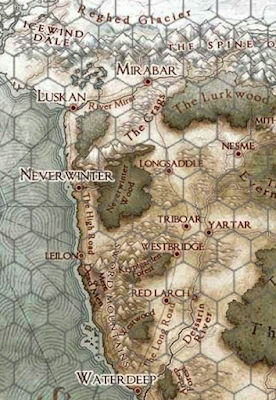 Above, Brithem sits along the coast, one-quarter of the way from Luskan to Neverwinter; Port Llast sits on the same path, three-quarters of the way between cities. It's important to note that the overland map is a metagame aid for the players - that is, the characters don't have access to the map, nor are they necessarily aware of every location it depicts. This is intended as a player resource only, to better understand the relative placement of the locations discussed in-game. It's OK to assume that the characters are aware of nearby towns and renowned cities like Waterdeep. Beyond that, players can ask me what their characters should reasonably know. The "Grimmantle" map, on the other hand, is intended as an in-game resource that's physically in Wren's possession. Characters may study and form opinions on its nuances to their hearts' content. Wren has had this since the beginning of the campaign, but I didn't want to post it publicly until the other PCs were privy to its existence. Sean mentioned at the end of last session that he felt a need for the players to take some time speaking to their characters' individual motivations for adventuring, and I agree. We did an exercise in defining initial motivations before we started, but that feels extremely antiquated at this point. I do think it's important to know what each PC is in the campaign for, both to help the party set its course and also understand why the characters are together in the first place. Let's plan to take some time at or before the start of the next session to have a brief discussion around this. Finally, I've created a spreadsheet that I'd like to try using to track the approximate wealth of each PC. I'll start by recording the current gold piece value of the coins and other valuables carried, and record debits and credits as accurately as I can. This should make it easier to track how treasure is split, who's in possession of what, and how much wealth the party has at its disposal at a given time. I still want players to mark their gains and expenditures individually, but I know those details can get muddy over the course of multiple sessions. As the daylight began to wane over Port Llast, the party made its way to the gates. Thirty-five miles north of Neverwinter, the small town of 700 was known mainly for its skilled stonecutters and excellent harbor - a small bay sheltered by a high, rocky spit, with a fine beach and inlet. The port was overlooked by cliffs upon which boulder-hurling siege engines could be spotted from the road below. Passing the gate-guards with few questions asked, Lincoln had become notably white and feverish, having broken into a cold sweat. As such, the party secured rooms at the Drunken Mermaid, a waterside inn and tavern, at two gold pieces per night each. Lincoln took his leave, and in the taproom the remaining PCs caught rumor that an inbound caravel had recently encountered a naga while traversing the inlet. Though no one aboard the ship was injured, water nagas, usually only found upriver or in freshwater lakes, were considered dangerous enough that a five-hundred gold piece bounty was placed on the creature by the First Captain (Port Llast's highest-ranking official). As the evening drew on, the party was approached by a cloaked man with long, dark hair. He carried a scimitar visible at his belt and wore a pair of forged bracers, though he appeared otherwise unarmored. After flipping a gold coin onto the table (which Wren quickly pocketed, before stepping away), he sat, introducing himself as "Rumolt the Wanderer." Rumolt explained that he was looking for adventurers to accompany him into the Neverwinter Wood to enact vengeance against the orcs of the Yellow Eye, a malicious tribe that had ambushed and slain his previous companions during a recent hunting expedition. Rumolt alone escaped, trailing the orcs to their forest lair before returning to Port Llast only a handful of days ago. To further substantiate his claim, he rolled up the sleeve of his right arm, revealing a jagged, clotted gash. Rumolt sought to recover what he could of his allies, and was willing to pay handsomely for capable assistance. After some deliberation, the party declined Rumolt's offer, opting to continue on its original path to Neverwinter while Lincoln recuperated in Port Llast. They set out the following morning, breaking at dusk amid an encampment of caravans halfway along the two-day journey between cities. As they prepared for the night, a raucous bonfire erupted across the encampment, surrounded by a dozen surly caravaners, bellowing and drinking heartily. Seeing opportunity, Wren and Riwyn approached the men and seated themselves on either side of a particularly intoxicated specimen, and while Wren teased the caravaner with innuendo, Riwyn pickpocketed his coin purse. Though the man tried to physically detain the women when they rose to leave, Arendeth's advance curtailed any possibility of an escalation. The caravaner passed out some time later, still oblivious to the theft. The following morning, the party ended its watches early and departed at sunrise, reaching its destination before dark. The PCs passed two days in Neverwinter, a city of more than 20,000 inhabitants (and one much richer in culture and diversity than Luskan), seeking information about Grimmantle and hoping to discern its approximate location. Arendeth procured shelter for Aranos and himself at the Sword and Shield, a Tempuran temple, while the others roved between inns (the Silver Harp, one gold piece per night), libraries, bookstores, the office of a local cartographer (Arphon, a middle-aged balding man), and the House of Knowledge, a renowned temple to Oghma. 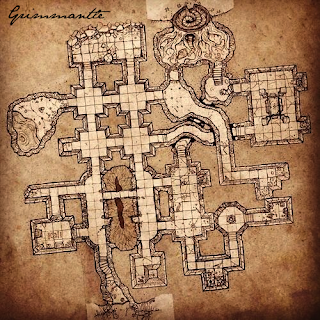 The aggregate yields of the party's research were that Grimmantle was built into the southern face of mountains, constructed partially above and partially below ground (similar to neighboring Mirabar), and would likely only be located with substantial magical aid. At the House of Knowledge, Berwyn was given the name and residence of a local diviner (Naerinth), though attempts to locate the wizard proved fruitless. Before setting out north again, Arandeth bartered the bloodstone from Lady Deidre to various traders, finally settling on a "best price" of 800 gold pieces. The return journey to Port Llast was uneventful. Rumolt was still present at the Drunken Mermaid when they arrived, and made a final offer of 100 gold pieces each, along with an equal share of treasure found, for the party's aid in the forest. The proposal would stand for one night only, as he otherwise meant to depart for Neverwinter at sunrise, hoping to have better luck finding help in a larger city. Wren inches ever closer to her third fighter level; unfortunately, being a multi-class PC without a prime requisite bonus makes it slow-going. She'll get there. Party totals are updated on the right side of the blog as well. Of note, the cost of Lincoln's week-long stay in town amounts to ten gold pieces. This covers all meals and lodging, and assumes that the dwarf found more affordable accommodations after the first night. I don't really go out of my way to be misleading with the dice. It tends to not be necessary very often, and most of the time I'm too preoccupied with making actual rolls, looking up information, and trying to decide on NPC reactions to worry about psyching out the table. Wren and Riwyn's incident with the caravaner drew some in-character criticism from Arendeth, which I think was very fitting, given his persona. For my part, the PCs can do as they wish and I'll try to make sure that the reactions elicited are fair and unbiased. This is an area where the DM of a narrative-style game can find difficulty, especially when plot lines assume a party of noble-minded adventurers. Characters stealing from non-threatening NPCs can unravel fixed adventure paths quickly and create a sticky situation for the DM, who consequently feels pressure to step in and wave a finger at the players wreaking havoc on his story. Fortunately, this game is not being run that way, so I can adjudicate these kinds of situations without a conflict of interest in terms of how I want the sessions to play out. I think the result of this is a much more organic environment, where any repercussions enacted on the PCs are based only on predetermined information (meaning that I won't hand-wave that the caravaner you're trying to pickpocket is actually a 10th-level wizard because I want to teach you a lesson) and untainted by any path that I'm trying to force. I don't doubt that, eventually, a thieving character's luck is likely to run out - but I won't go off the reservation trying to make it happen. The biggest thing the players need to remain conscious of with these kinds of dealings is the overall cohesion and trust within the party. When that starts to break down, games can get derailed, characters can become ousted and players can leave the table with bad feelings. Something to keep in mind going forward, though I don't think we're anywhere close to that happening at present. Note: A bit of additional detail regarding Grimmantle is provided below, as I don't think I relayed Mara's findings completely during the game. The kingdom of Grimmantle in the Mlembryn lands falls to the Thousand Fangs orc horde, which then assails Illusk and Neverwinter. The horde is eventually blunted and scattered by a mercenary army led by Grauth Mharabbath, "the Knight of Many Battles." 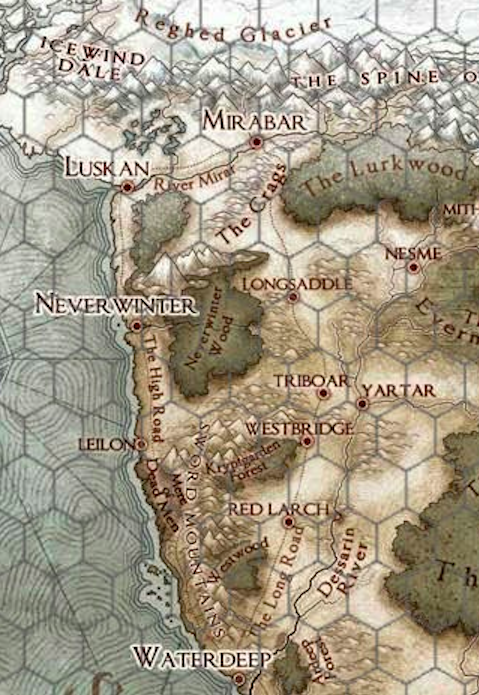 Armed with this information, the PCs set their eyes south to Neverwinter, in hopes that the resources of a larger city might reveal more detail still. As they prepared to leave, they were approached by a blond-haired soldier, notably one of the ballista operators at the northeast farm. The man bowed, giving the name Aranos Dalebriar, and he humbly petitioned the party for employment. Aranos explained that he had first come to Brithem more than a decade earlier with a lone surviving family member, an older brother, who most recently was slain during the dragons' initial assault upon the castle, before the PCs arrived. Asking for nothing more than food, shelter, and the opportunity to learn (the party declined to offer a wage), an agreement was made. The morning of their departure, Lady Deidre met the heroes inside the castle gates, gifting them a small, leather pouch containing a polished gray stone with inclusions of deep crimson: "bloodstone," she declared it, and an amount of which valued upwards of one thousand gold pieces, this far west. Exchanging well wishes, the party took to the rolling trails leading back to the crossroads, which they reached before sunset that same day. No campsites were occupied, at present, though evidence showed that some were recent; fearing Whisper's bandits, they continued south along the High Road for an hour before sleeping, fireless and with watches kept. The next three days passed uneventfully, though Arendeth took the opportunity to converse frequently with Aranos and impress upon the warrior his values. Aranos spoke of having been raised in a small village far south of Neverwinter, many years ago; his father was a stonecutter. On the fourth night of their journey, rain fell long into the evening, and the party was forced to scavenge for usable wood and set a fire for warmth with the aid of lamp oil and a casting of produce flame. The first watch heard skittering sounds emanating from the underbrush, though several minutes later the noises passed. The following day was dry again; late in the morning, a giant hawk attacked the party from behind, assailing Riwyn (possibly due to the presence of Merlin the owl on her person) multiple times before the bird could be driven off by volleys of arrows and a light spell directed at its eyes. A few hours later, they crested a hill looking down upon a walled town, and arrived at the gates of Port Llast in the waning afternoon of the Ninth day of Mirtul, 1354 DR (the Year of the Bow). Aranos is formally a hireling (albeit an unpaid one, currently). The party's newfound prestige and the ex-soldier's situation brought the sides together, come what may. His actions will be mainly decided by the characters (within reason), and his morale and loyalty influenced heavily by the treatment he receives. This is far from a new concept in AD&D, though it's not one we've employed much in the past. I want to state clearly that Aranos is not intended as a "DMPC" and neither does he consume a share of the party's awarded experience. Looking forward, depending on how their mutual relationship blossoms (or wilts), there may be an opportunity for Aranos to become something more. Henchmen are a resource we've dealt with even less over the years we've played, but an ally taking on such a status could prove a valuable asset, indeed. "Finally, there are various spells that do not provide an x.p. bonus, though they affect the combatant's attack or defense. Partly this is because of the difficulties in tracking the damage done, but largely it must be understood that casting a spell is very often not a risky action for a spellcaster. This is especially true of spells that can be cast well ahead of a battle, such as bless, armor, phantom armor, barkskin or stoneskin, etc." Again, I'm only dabbling with this system for now; I'll make a formal announcement if I decide to move to it permanently. I always try to be attentive to the players' interest levels and the varying degrees of distress or frustration around the table when we play. While joking and kidding around during D&D games are inevitable (I'll be the first to admit that I regularly partake), I want to make sure everyone understands that I put a good deal of work into preparing for (and recapping!) our sessions, and that players put a lot of thought and effort into creating and developing their characters, both in and out of game. I think we all need to remember that lines are easy to cross when having alcohol-supported fun, and make sure that our enjoyment never comes at the expense of others' or detracts from the game itself. I've seen some of that over the past couple sessions and kindly ask everyone to please keep these points in mind. I'll work to help set the right example as well. About as much as I can be. Running on Saturdays is nice, as there's time to think during the day and get mentally immersed in the campaign details. Some stats, encounter tables, and fleshing out a few of the trails the party might follow will have to be enough. AD&D is very preparation-friendly to anyone comfortable with the rules. For tonight, I do plan to track damage according to the Tao system discussed here, as an experiment. I wrote up a quick spreadsheet that help does all the math. I'm not planning to switch over to this way of doing XP yet, but I do want to see how the numbers compare to what I'd give out traditionally over the course of the next couple sessions. What sets D&D apart from any other game is that you, as a player, can do anything, bounded only by the parameters of the campaign world and the limits of your own imagination. RPGs have always been distinct from other games, whether board, card, video, or pen-and-paper in this way; it's the primary reason we choose to play them. Every D&D game I've ever run or played in has been a learning experience for me as a DM, and often, it's the latter that tends to be the most eye-opening. DMing is a fantastic way to gain comfort with the mechanics and managing the logistics of a complex, fantasy RPG. But it's the rare occasions where I get to step in and be a player that I'm truly enlightened to what elements I like and dislike in a game, whether it's the style, the setting, the edition, or anything in between. Those experiences are taken back and folded into everything I do as a DM going forward. Most recently, it was the chance to play in Jason's play-by-post that showed me the real potential of a sandbox style game. I've always liked the prospect of a player-driven campaign, but have never been great at stopping myself from weaving elaborate narrative plots with pre-staged and scripted climaxes. And once you make the effort to come up with and start running through the scenes in your head, you develop a bias toward ensuring that they materialize at the table. While some players really like being a pawn in the DM's story, what Jason's game taught me was how much I, as a player, didn't. In the play-by-post, my character Raith's future wasn't going to get pulled out from under me or dangled along by a string. The other players and I were in control, and this was of paramount importance to my emotional investment in the setting, which soared from the moment we started and for the duration of the time we played. This is the fundamental experience I want to deliver to my players. To this point, I've done a good amount of stringing along, and have done so openly, to give the players a chance to meld and familiarize themselves with the game world. Now that this has been accomplished, however, and the PCs have found a measure of local notoriety defending a small fiefdom, I'm dropping the tethers and allowing the campaign to unfold as the PCs see fit. The options before them are endless. More importantly, the choices are theirs. How do I prepare for such an array of possibilities? That's better a subject left for another post - after I figure out how to do it. It's a natural thing as DM, I think, to strive to control the direction of the party. To railroad; to set short- and long-term campaign goals, rather than let the characters define these for themselves. Relinquishing that control makes the DM's job both easier and more difficult at the same time. Easier in that plots need not be preconceived nor interwoven; harder in that there's much more pressure to exhaustively detail the landscape of the campaign world and how its regions, settlements, and populations subsist and interact. Ravenloft is the sadomasochism of D&D. 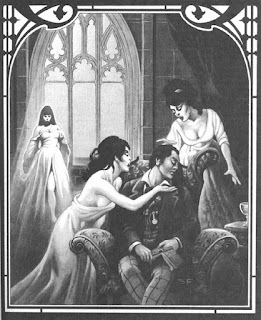 In Ravenloft, the DM teases, torments, and defiles the party not only to cause anguish but ultimately for the players' enjoyment. Ravenloft is a ticket that grants the DM free reign to wrest control from the characters at all times; to tear them away to new domains at the crack of a whip; to lead them along by a carrot that remains ever out of reach. 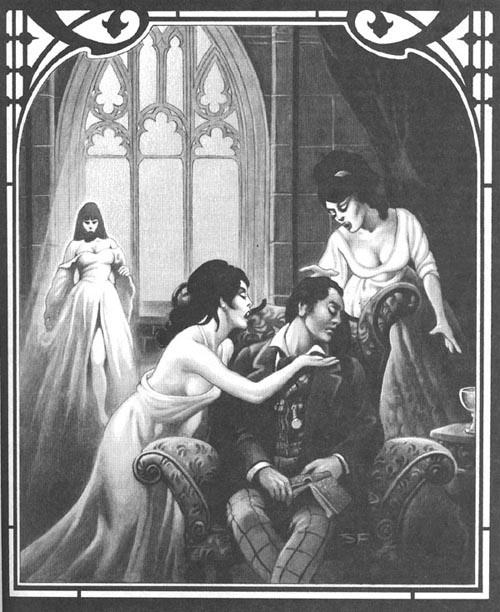 Ravenloft is a diabolical, deceitful, and magnificent campaign setting. But it's also an excuse, and a crutch. That's the main reason in the end that I elected to stay away from Ravenloft, as much as its allure still calls to me at times. I wanted to give the players something they could truly make their own, without the mists always encroaching and threatening to intervene. There's a far greater challenge and much more to experience this time around. I've always taken an "ends justify the means" approach to awarding experience in D&D. It doesn't matter if the frost giant whittled the PCs to within an inch of their lives, or if the mage sneezed and a boulder fell and crushed its head before combat ever began. The result arrived at was the same; who am I to judge the party's methods? It can get a little silly, when you think about it. In the case where the mage sneezed, the fighter might literally have been standing around doing nothing and reaped a sizable XP award for it. Or maybe he was about to do something stupid, like leave his weapons and armor behind and try to tickle the giant's ear with a feather. It doesn't matter. The ends justify the means. The party defeated the giant, so the characters gain and split evenly the XP for doing so. It's important, when issuing XP for a defeated enemy, to consider whether the party members were actually at risk (or at least, whether they believed themselves to be at risk). But that also can extend beyond the actual confrontation to the events leading up to it. If the PCs slew a band of orcs by firing arrows from atop a cliff that made them nearly impossible to hit, I'd still award the party full XP so long as the situation could have reasonably unfolded differently. For example, if the party had chosen to take the mountain pass instead of the low road, that decision led to the advantage of higher ground, and consequently the ease of their victory. The same course might have made an encounter with a wyvern that much more treacherous. That is to say, even though the party in this example was not at immediate risk while firing upon the orcs, they were still at general risk in their surroundings, and gained experience from decision-making that led to a successful end result. This is definitely not a combat-centric way of looking at XP. A key aspect of this approach is that it suggests XP not be awarded for unsuccessful endeavors by the PCs, regardless of good tactics or how much bad luck might have contributed to their failure. Should the party that battled the giant ferociously for many rounds before fleeing really be awarded nothing? It's a hard question to answer, but my game allows for just that, since the party, despite its efforts, wasn't able to figure out a way to best its foe. For better or for worse, the ends justify the means. This is where my subjectivity does come into play. I commonly issue "story awards" when in-game milestones are achieved, though this is a bit of a misnomer. It implies that the party is running through a narrative, and that the group has ventured far enough down a specific path to complete some premeditated story arc that I'd conceived. That's not really what I mean to represent. "Story awards" in my campaign would be better named "adventuring awards" or "execution awards"; they serve to reward the party for impacting the game world in a meaningful (and intentional) way. The two recent sessions involving black dragons from the Witherwood are a good example. In session #4, when the first dragon was slain, I issued a massive bonus award of 4,000 XP. I called this a "story award," but what it represents is the impact the PCs had on the fiefdom of Brithem. The party, through its actions during the session, turned a situation in which the entire castle and its farms could potentially have been lost, into one where only a single Brithem soldier was killed before the dragons were turned away. The 4,000 XP story award was a measure of the characters' impact on Brithem and its inhabitants. It's also noteworthy that the reason these awards exist in my game at all is that the campaign is generally not combat-and-treasure-focused enough to give out XP strictly "by the book" and expect the party to advance at a reasonable rate. Given the infrequency with which we play, it still requires many months of real time for low-level PCs to gain a level. The "story awards" help supplement both the nature and real-life pacing of the campaign. For me, this system works well, even though it leaves a large amount of the party's advancement up to my discretion. The reason for writing all the above, is that I recently read Alexis Smolensk's alternate XP system, which rewards party members for dealing, taking, and witnessing damage when involved in combat, regardless of the encounter outcome. The justification for this is that all of these represent learning experiences for the characters. I personally find this a fascinating approach to XP, and think it makes a great deal of logical sense. For my campaign, I'm not sure our sessions are combat-heavy enough on a consistent basis to effectively apply Alexis' system (although the multiplier could always be raised to help compensate). It also comes saddled with additional in-game bookkeeping (on my part) and questions where it pertains to certain types of spells. But I love that it incentivizes players to take risks and work together, and provides a good framework for accelerating the advancement of lower-level characters that enter the party due to a new player or the death of a previous character. I somewhat dislike that it fails to award tactics that lead to a greater degree of success by the party, though that could be supplemented by the story awards described above. It's something to think about trying as the game goes on. The fundamental difference between these two systems is that the traditional views experience as a measure of achievement, while Alexis' views it as a measure of learning. Alexis' system also encourages the players to take more risks, where the traditional rewards tactics that avoid excessive risk. I worry that Alexis' system creates a dynamic where the players are faced with conflicting goals: take the bloodier path and gain more XP, or employ superior tactics and ensure everyone comes out alive. It definitely isn't a system I'd move to without significant buy-in from the group.